There are a number of different types of ligature I think are worth trying, and they can make a huge difference in projecting and creating and improving your own sound. BG France have created a leather range, and the Revelation or the Super Revelations which help the sound become clearer and brighter, and, in the case of Otto Links, help the reed to stay more secure. There are others worth a try like the Francois Louis, Rovner and the Vandoren (with different plates to give you a different sound). Others are the Bois and if you can locate them Olegature. They do; how much is debatable. The best idea is to experiment with the many different types and also see what your very own individual sound can do with it. 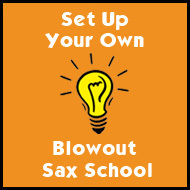 For beginners use a metal ligature like a Rico sax ligature or H silver Lig. 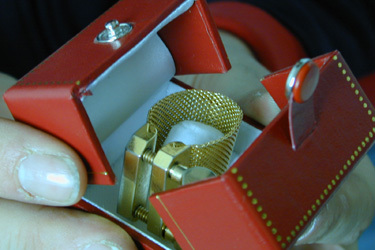 Stan uses The Bois saxophone ligature and says is probably the most revolutionary ligature design seen in years. And, like all good designs, it is remarkably simple. 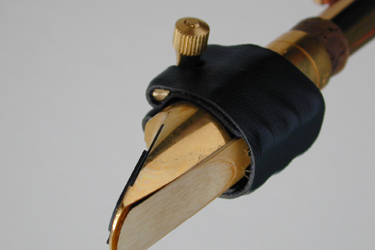 This ligature consists of a single black ring that fits snugly round reed and mouthpiece. There are no screws to tighten. The Bois doesn't slip or stretch. It allows quick and easy reed changes. 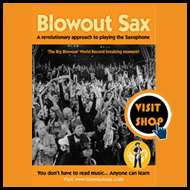 It is totally usable from day one by any saxophonist -- beginner or advanced. The Bois ligature provides optimum reed vibration so you get full range of your chosen reed's sound without the all too frequent distortion or dampening that occurs with poorer ligatures. Oh, and yes, and it comes with a very stylish soft mouthpiece cap as well. 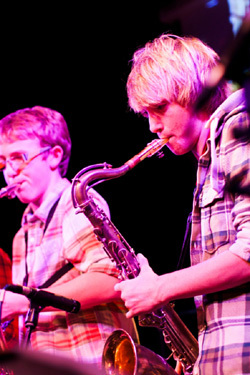 Seen here is Lewis Blanks is playing a francois Louis with a Dave Guardala mouthpiece. The Olegature resembles a very flashy gold choker! 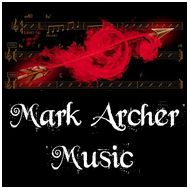 The truth is it does give you the depth of tone, and ease of top and bottom registers as well as projecting a rounded tone. Olegatures can be used on Otto link, metal and ebonite, alto and tenor, Lawton metal tenors and Meyer alto rubber.